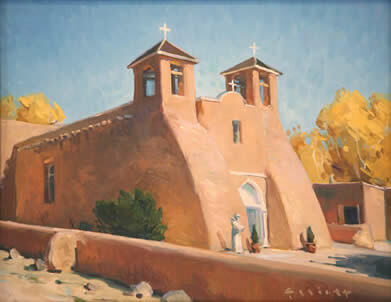 Josh Elliott, Colors of New Mexico, Oil on Panel, 16" x 20"
osh Elliott recalls learning to paint landscapes in his youth with his father, wildlife artist Steve Elliott. He learned the importance of painting from life and discovered his passion for painting outdoors, which he continues today. For the past 12 years, Elliott has been honing his artistic skills. His latest paintings reflect his exploration of compositions, light and dark values, and how the eye moves across the canvas. Elliott finds himself inspired more by the painting process than by subject matter. 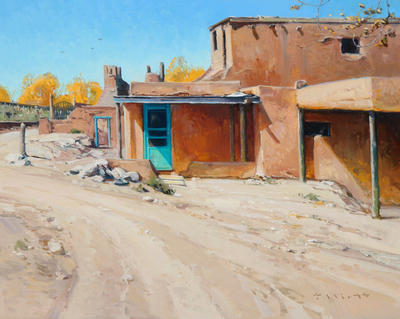 Josh Elliott, Autumn, Ranchos de Taos, Oil on Panel, 11" x 14"
His new landscape paintings are a variation of past works. Images will include scenes from his native Montana as well as parts of Wyoming and New Mexico. Collectors will notice more tonal images with tighter values, some bright sunlit paintings, and two nocturnes, a fairly new subject for Elliott that he plans to continue. “I’m excited with it. Exploring new ideas and approaches charge me up,” he says. Elliott depicts mostly untouched landscapes and occasionally will add a human element to illustrate man’s relationship to the land. Some of his paintings suggest a narrative while others simply convey the beauty of nature. 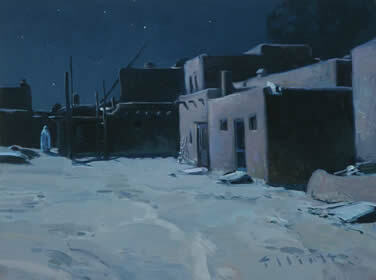 In one of two nocturne scenes, titled Midnight Breeze, Elliott places a sole figure as the focal point, beckoning the viewer to develop their own story line. Josh Elliott, Moonlit, Oil on Panel, 9" x 12"
In the piece titled February’s Blanket, Elliott tackles the challenging subject o snow with its close values. In this tonal painting, he uses strong design and color variations to lift the scene from ordinary to exciting. 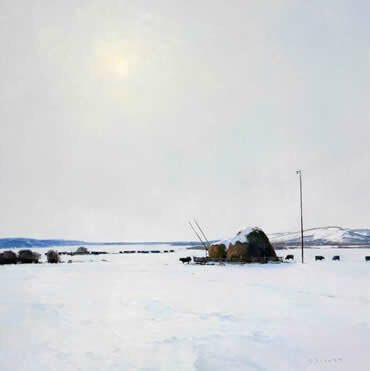 Elliott experiments with a low horizon line in another painting titled Midwinter featuring a grain elevator and a big sky. 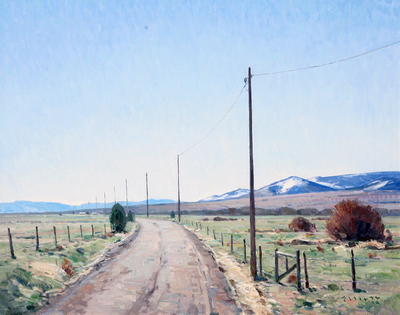 Josh Elliott, Big Sky February, Oil on Panel, 36" x 36"
Elliott has won several awards, including the Honorary Chairman’s Award in 2007 at the C.M. Russell Art Auction and the Edith Hamlin Award at the 2007 Maynard Dixon Country Show in Mount Carmel, Utah, among others. This talented young artist enjoys depicting shared experiences and says he paints because he loves it. “I like to share a common experience or introduce them (viewers) to one of mine,” says Elliott.